My thoughts: I was chosen as one of 1,000 bloggers to be part of Crystal's launch team for her new book. Even if I hadn't been chosen, I promise I still would have read this book. If you haven't yet read her first book, Money Saving Mom's Budget, I highly recommend that book as well. 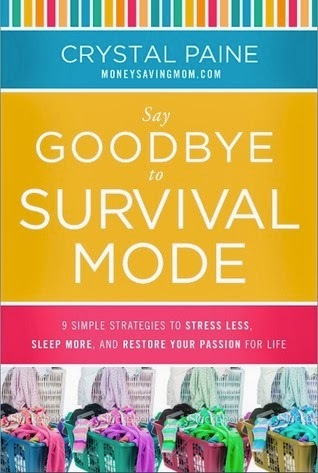 If you struggle with staying sane, Say Goodbye to Survival Mode is absolutely for you. Maybe you don't struggle with your sanity (bless your heart!). Maybe you think you've got it all together. This book is still for you. I don't know how often I struggle with my sanity. I always choose my sanity first, and that informs how I spend my time. But even then, I still struggle with juggling all of the various aspects of my life: blogging, mothering, being a wife, homemaking, and carving out precious alone time. I wear many hats, as does nearly every single person I know. Aren't those quotes fabulous? I'm telling you - this is a must-read book. If nothing else, it will serve as inspiration for you that you are doing the right thing! I say no to others a lot so I can say yes to myself and my family more. Sometimes, I struggle with this because I can feel guilty saying no. But Crystal affirms that saying no is important! Especially when saying no to someone else means you can say yes to yourself and your family. Give this book a go and just see if it doesn't change your life. Thanks to Crystal Paine for sending me a copy of this book in exchange for my honest review. thanks for your review. I've been wondering about reading the book. The title really grabbed me...think I'll grab the book & read it myself! Awesome! This book will rock your world.